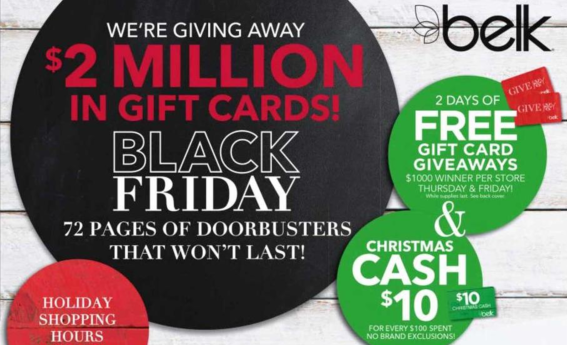 Belks Black Friday Doorbusters start at 6PM on Thursday, November 24th and will go all the way through 1PM on Friday, November 25th! Check out the FULL Belk Black Friday Ad Scan HERE. The first 200 customers at every store will get a FREE gift card valued anywhere from $5-$1,000. Plus, Belk is guaranteeing a $1,000 winner in every store! You can also earn $10 in Christmas Cash for every $100 spent on November 24th – 25th. You will be able to redeem Christmas cash from November 27th – December 10th. Also know that they will be offering Doorbusters online all day Thursday, November 24th, with FREE standard shipping on a $50+ purchase from November 25th – 26th or FREE shipping for all cosmetic orders! You can also grab an extra $10 off your first $50 or more purchase with the coupon found in the ad (valid on regular and sale price merchandise), valid Thursday, November 24th and Friday, November 25th.